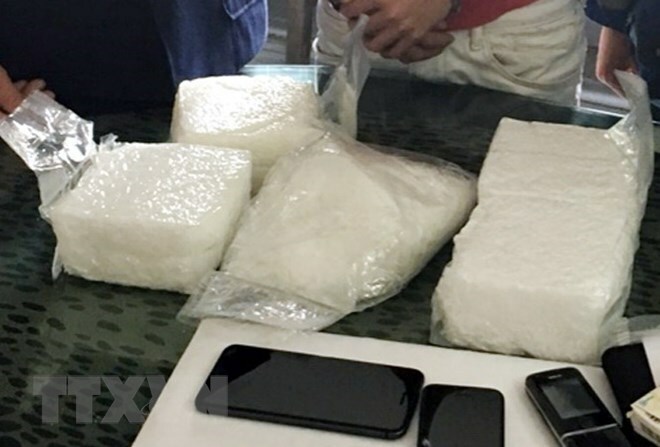 Thanh Hoa (VNA) – Police in the central province of Thanh Hoa caught red handed a man trafficking ten kilogrammes of crystal meth from Laos to Vietnam. Loc Van Duong, born in 1972 in Son Dien commune, Quan Son district, Thanh Hoa province, was arrested in the district’s Son Lu commune on February 10. The man confessed that he was hired by a Laotian to transport the drug from Laos to Vietnam for 200 million VND (8,600 USD). On January 19, police of Thanh Hoa province’s Quan Hoa district caught 40-year-old Hoang Ngoc Bang from Muong Ly commune, Muong Lat district selling a packet of heroin and a meth pill in Trung Son commune. Searching the man’s house, they seized 10 plastic bags containing 2,020 meth pills. The same day, Quan Hoa police also arrested 36-year-old Vi Van Dong from Ta Ban hamlet, Trung Son commune, for drug trafficking and storage. They found 4,200 meth pills, a brick of heroin, 1 kg of crystal meth, a homemade gun and knives, swords and other tools in his house.